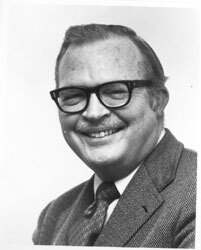 Derge came from Indiana University — where he served from 1956 to 1972 and twice served as acting president — to take SIUC’s top job in 1972. He had previously taught at the University of Washington, Northwestern University and the University of Missouri before joining the government faculty and later the administration at Indiana. A political scientist, he belonged to the U.S. Advisory Commission on International Education and Cultural Affairs, was a consultant on higher education and international education in the U.S. Department of Health, Education and Welfare and served as a White House consultant on special projects during the Nixon years. Within months of his arrival at SIUC, the Kansas City, Mo., native was elected president of the Illinois Joint Council on Higher Education. Among the highlights of his job here was leading a large sports delegation to Peking. When he stepped down, he joined the University’s political science faculty full time, where he was an expert on political parties, public opinion and the presidency. In 1987, he was honored as one of SIUC’s Outstanding Teachers.